The 72nd Annual Tony Awards telecast was one of the most delightful in recent memory. Led by theater-loving emcees Sara Bareilles and Josh Groban, the Tonys ceremony featured a quirky style of humor and moving sentiment unique to Broadway's biggest night. With triumphs spread across acclaimed new works and innovative revivals, Broadway fans of all theater tastes had plenty of reason to cheer. Even if your favorite show didn't take home a Tony, it was more than clear that the stars present at Radio City Music Hall were having the time of their lives. 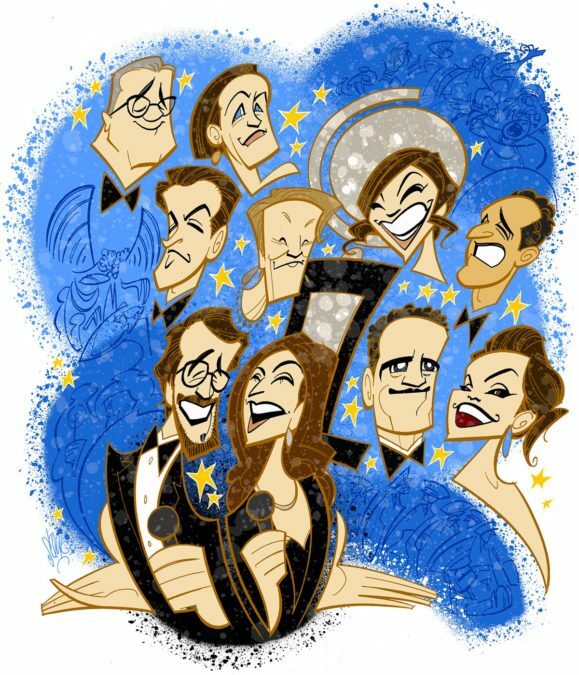 To celebrate the special night, Broadway.com Resident Artist Justin "Squigs" Robertson sketched a portrait featuring every beloved acting winner and cheered Tony-winning production alongside the evening's unmatched co-hosts.